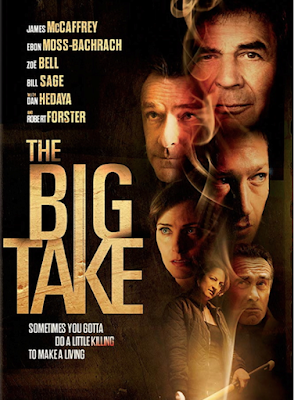 The Big Take has a limited theatrical run at Cinema Village in New York City from September 7-13. Available on DVD and Digital on September 4. Justin Daly's The Big Take is an intriguing, thrilling and original piece of cinema that is mesmerisingly atmospheric and an exceptional debut film from a filmmaker who is not afraid to take courageous creative chances. At the centre of an elaborate plan by Vic (Slate Holmgren) to get money to fund a film by screenwriter, Max (Ebon Moss-Bachrach) is Hollywood actor, Douglas Brown (James MacCaffrey). Brown is under the impression that he is being blackmailed in order for a damaging video of himself not to be shown in public, but he is really part of a crazy scheme by Vic to fund a film and make himself a producer. However, Brown has access to people who can easily discover who Vic and Max are and when a visit by private investigator, Frank Maniscalpo (Dan Hedaya) to Max and his wife, Oxana (Oksana Lada) goes horribly wrong, things start to turn nasty for everyone involved. The Big Take is a highly impressive directorial debut by Justin Daly. It is evident that he has a strong sense of who he is as a filmmaker and is uncompromising in the execution of his first film. Daly's style of direction is not unlike that of a younger Quentin Tarantino as The Big Take has an atmosphere reminiscent of that of Pulp Fiction. However, the screenplay (also written by Daly) cannot be compared to the 1994 film as it is a highly original piece of work. It's creativity in the darkly comical narrative allows for a heightened sense of suspense and unpredictability which is supported by a soundtrack that not just enhances the atmosphere, but excites and intrigues. The reason it is so intriguing is that types of music are matched with landscapes that it would not usually be associated with in film (such as reggae accompanying the image of a motorcycle on the streets of Los Angeles), but unexpectedly works so well. It's flowing dialog is superbly written for the screen and delivered with ease by the impeccable cast. Ebon Moss-Bachrach as the unassuming Max who is the star of the film. James MacCaffrey's Douglas Brown is the Hollywood stereotype which people love to hate right from the word go, but Max is the underdog who could be the real hero of the film that everyone barracks for. He is the relatable writer trying to make his way in the tough world that is Hollywood and trying to get people to take notice, so when trouble in the form of attention comes his way he doesn't question it. Zoe Bell is also a standout as the girl who is way scarier than she initially seems, Edie. The Big Take explores the side of Hollywood where people will do absolutely anything and question nothing to finally get their big break. Justin Daly breaks into the filmmaking scene with incredible power and is without a doubt one to watch in the future.